As of the 12th of January our pack had been increased by one. This little fellow is Baird. 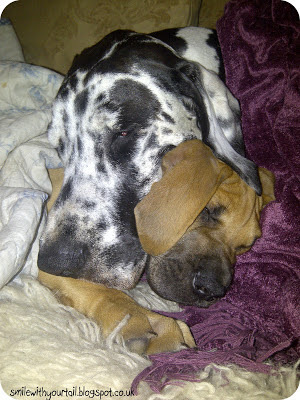 As you can probably guess he is a fawn Great Dane from some superb breeders across the country from us. Now don't let those eyes fool you, he is a total handful. He has yet to learn that he can't play 'bitey face' games with us all the time and that he needs to leave us alone when we are sleeping. Besides that he is a joy! 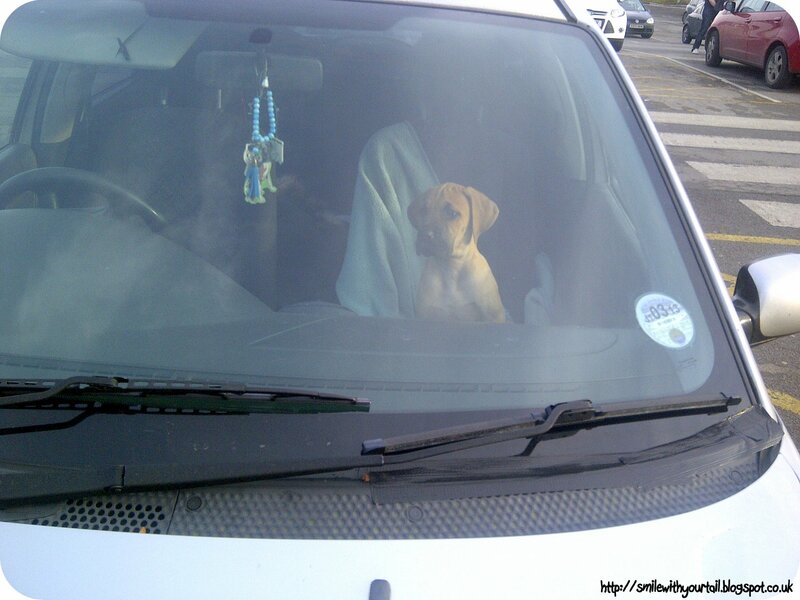 Mum took a 7 hour round trip to go get him when he was 8 weeks old-and she said he was such a gentleman in the car. He slept the whole way back, apart from when Mum stopped at the motorway services to get some diesel and came back to him sitting up wondering what was going on! After the little one had got home, gone 'toilets' outside (he held in it the whole journey back- Mum and her car where relieved!) and settle in, we were introduced to him! Dante and Daisy have seen puppies before, Dante simply put Baird in his place and then wanted to play, so did Daisy Boo..but as for me- I had no idea what to do! I wouldn't let him touch me ( I thought he had some form of puppy cooties!) 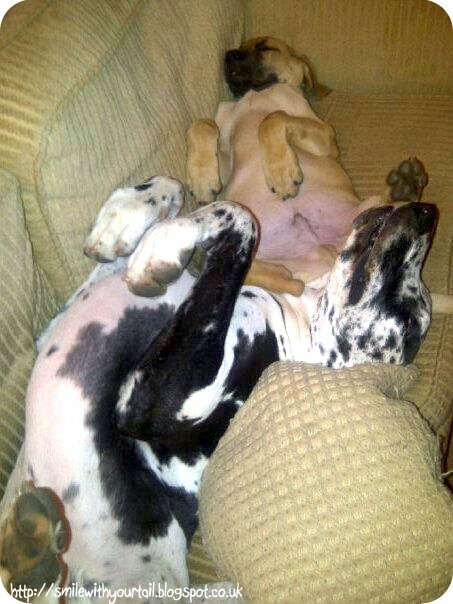 and Mum was careful not to stress me out too much as she know that added stress can cause us Great Danes to bloat. I hate to admit it, but I think I'm going to like helping my little brother grow up.Dante and Daisy Boo are enjoying having a little one around too, Dante for the cuddles and Daisy Boo for the bitey face games! We are getting a rather big pack of doggies now, so Mum is very careful to keep up all aware of what we can and can't do, I'm still a baby myself so I had to have some warnings from Mum to not to be too rough with my little brother- I am getting better, I just don't realise how big I am! We are all still on the BARF diet, but Baird is getting 4 meals a day while we get two. Mum is also bulking up his meals with Arden Grange dry food which have all the essentials for a growing pup. Mum keeps the feeding routine the same first, she puts the bowls down, makes us wait, then release us Dante first, then Daisy Boo then me. Now Baird has learnt to sit and wait till he is allowed to eat. As you can all imagine it is hard work for all of us! Baird seems to be having a great time though. We also got to play in the snow, but that is something to tell you about another day. I'm going to grab some sleep while I can! Back from our Winter Hibernation! Hello Everyone, and a belated HAPPY 2013! We hope you all had a pawtastic Christmas and that Father Pawmas got you all everything you wanted....and yes before you all ask, we were subjected the the terrible dress up act that happens every Xmas to doggy kind across the globe- ugh. Now I know a lot of different critters do it, such as bears & hedgehogs but we never knew Mum could hibernate as well. To make things worse she dragged us into the hibernation funk too. But even though we haven't been blogging we still have been up to lots of adventures-honest! But we better start by telling you all what we got up to over the holidays. Which was nothing. Truth be told doing nothing was great, while Mum was out at parties and getting stressy about all the Christmas food and decorations we just sat on our bums doing nothing to help. But how much is a doggy meant to help around the house anyway? We were not blessed with the luxury of opposable thumbs. We got lots of chewy toys and treats on Christmas morning, and a very special doggy Christmas dinner, complete with turkey and gravy- yum! I must say I'm glad the festivities are over, the ridiculous attire in public places is over..for another year! Can you believe Mum took me out like this?! The weather on the other paw has been miserable, we haven't seen the sunshine in over a fortnight now, but before that it was so cold that the sand at our favourite beach was frozen, now that's cold, for us anyway. Dante is still struggling with his legs, the cold weather certainly isn't helping, but on recontamination from the vets, who advised to take Dante up hills/ steps etc. to help strengthen his ligaments in his hind legs. So we go for hikes up the sand dunes almost everyday, and its is working wonders! He is still a bit stiff a night but he is less sore for the majority of the time and can get himself around much easier, hooray! It's great to see him having 'puppy' moments again, although he can get a bit carried away with the zoomies and often ends up hurting his back end in the process, very much swings and roundabouts. His diet is still strict & along with his many joint supplements and medication we are slowly getting there! A year new means new resolutions, but we have been so busy I guess we all forgot- well I don't need to make any because as we all know- I'm perfect ;) We do hope that if you have made any you are sticking to them! We are looking forward to what 2013 is going to bring, Dante will be 5, Daisy Boo 3 and me a big old 2! There is another 'thing' coming into our lives soon. Now I don't know what is going on but Mum went away for almost a whole day, came back smelling all funny, with some photographs. Any idea?! We hope you are all good & will pop by for a visit very soon. We hope you all had a pawtastic Xmas and a great start to the year. As you may have noticed our blog has sort of slipped into a hibernation mode. We (Mum) has been really busy so hasn't been able to get online much. But don't worry, you will hear from us properly in the next few days- there is so much to tell you all about! We can't wait to catch up on all your blogs and hear all about your festive holidays!